The Santa Clarita Valley Search and Rescue Team is a volunteer group formed to assist the Sheriff of Los Angeles County in search and rescue operations or any other governmental agency upon request. They also promote wilderness recreation safety for the people of our community. The SCV Search & Rescue Team works under the direction of the SCV Sheriff's Station. The team is made up of reserve deputies who get paid a $1 a year, and civilian volunteers who work for free because they love the job. All of the team members are Emergency Medical Technicians. The Santa Clarita Valley Search and Rescue team not only helps your local Santa Clarita Sheriff's Station, but also responds to mutual aid calls, where disasters or other situations outside our valley require their skills. 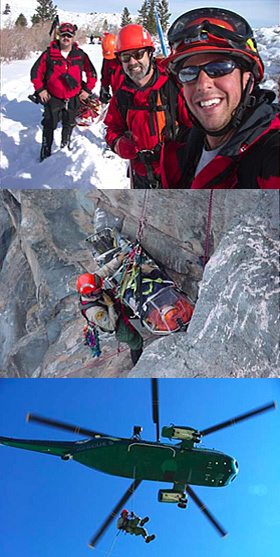 The Search and Rescue team can and will respond 24 hours a day, seven days a week to calls involving vehicles over the side, earthquakes, lost hikers, power outages, and missing people of all ages, along with rescuing people or recovering evidence in locations involving challenging terrain. Last year, the Search and Rescue team dedicated more than 4,000 hours of service to the Santa Clarita Valley. Copyright © 2014 Santa Clarita Valley Search and Rescue. All Rights Reserved.